NEW ZEALAND journalists are working longer hours, and feeling more pressure, both ethically and resource-wise, than they were only two years ago, a new research survey has found. A survey of New Zealand professional journalists, published today in Pacific Journalism Review, also shows for the first time that women journalists are paid less than men, despite making up the bulk of the workforce. The survey shows female journalists, despite predominating in the profession, are significantly disadvantaged in terms of promotion and income. The average before tax income of all journalists was $69,400 (in 2015 dollars) but the median after-tax salary of women was 26 percent lower than that of men of equivalent rank and experience. The biggest factors affecting journalists’ income, in order, are experience, where they work (with those in provincial areas are paid less) and gender. Women were also disadvantaged in terms of promotion; while only half of men work in non-manage¬ment roles, which is the case for two-thirds of women. The median age was 44 years and the mean age 43.l6 years. The survey, part of the Worlds of Journalism project involving 64 countries and 27,500 journalists, was led by Dr James Hollings, head of journalism at Massey University. The research team included Professor Folker Hanusch of the University of Vienna, Austria; Dr Ravi Balasubramanian of Massey; and Associate Professor Geoff Lealand of Waikato University. The dramatic changes in news brought about by the switch to digital dissemination and the rise of social media are reflected in journalists’ perceptions of change in their industry. The survey asked them to rate 23 elements that may have altered over the past five years in New Zealand, with 1 being “weakened a lot” and 5 being “strengthened a lot”. “Social media, such as Facebook or Twitter” strengthened the most, with a mean rating of 4.8, followed by “the use of search engines” (4.63), “user-generated content, such as blogs” (4.4), “Profit-making pressures” (4.35), “Advertising pressures” (4.07) and Working hours (4.03). There are significant shifts from a previous survey in 2013—while the ranking of the top three change elements is the same, the amount of perceived change has strengthened. Also, advertising pressures and working hours have now entered the top five, replacing ‘The importance of technical skills’ (4.0) and “Audience feedback” (also 4.0). The increasing commercial pressures on journalists also showed in those elements identified by respondents as having weakened the most. These were “time available for researching stories” (1.76), “the credibility of journalism” (2.25), “ethical standards” (2.4), and “journalists’ freedom to make editorial decisions” (2.69). It is concerning that journalists feel these changes have affected news quality, with a perception that the credibility of journalism, ethical standards and freedom to make editorial decisions have all fallen. Another concern is that despite evidence of some improvement, Māori, Pasifika, and Asians remain under-represented in newsrooms. Māori make up only 7.9 percent of the journalism workforce, despite making up 15 percent of the general population. On the positive side, journalists are better educated than they have ever been, and overall adherence to ethical standards remains high. Almost all respondents (96 percent) agreed with the statement “Journalists should always adhere to codes of professional ethics, regardless of situation and context”. Also, job satisfaction remains high. Almost four in five (78.6 percent) stated they were “some¬what” or “very satisfied” with their job, compared with 82.1 percent in 2013. It is clear that New Zealand journalists, despite these pressures, continue to take their role as guardians of democracy very seriously. The large number of independent operators captured in this survey suggests that the digital revolution is opening new opportunities for journalists to start their own smaller outlets, a challenge that appears to have been taken up especially by older journalists. The researchers interviewed 539 New Zealand professional journalists in December 2015 and January 2016. This is 23.6 percent of the 2415 journalists invited to participate, giving the survey a margin of error of 3.8 percent at the 95 percent confidence level, or 5 percent at the 99 percent confidence level. PJR is an international research journal published by AUT’s Pacific Media Centre in the School of Communication Studies and the editor, Professor David Robie, director of the PMC, says this survey is the most important study to have been completed on New Zealand journalism. 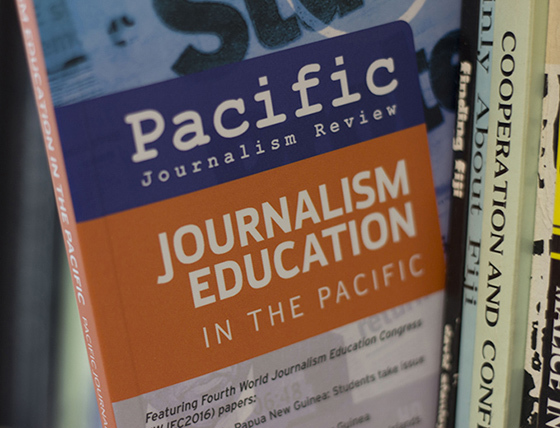 He says the latest edition of the journal also features important Pacific journalism research, including several papers from last year’s World Journalism Education Congress (WJEC16) conference hosted at AUT. Topics include last year’s student upheaval in Papua New Guinea climaxing in police opening fire on peaceful protesters, journalism training in the Solomon Islands and “cyberbullying” in Fiji. Dr Robie paid tribute to the University of Papua New Guinea, where the research journal was founded in 1994, and the University of the South Pacific for their contribution in developing Pacific Journalism Review in earlier years. He also praised the NZ Institute for Pacific Research for enabling several regional media academics to be funded to go to WJEC16 and to follow through with publications in PJR.